The brick breaker genre… a few time ago a new one came out for Xbox but regardless I still feel that this concept is laying a little dormant. I was excited when developer Hero Concept contacted us about Doughlings Arcade, I will not keep it a secret that I simply adore this old genre. With an old genre comes great responsibility, making it a fresh experience, honoring the legacy from previous games and most importantly make sure that you don’t give the genre a bad name. So how did the Turkish developer do? Find out in this review! Your task is to collect three stars by hitting Doughlings with your ball, you have to keep the ball in motion by not letting it drop below your screen. In the meantime you can collect thumbs up icons to fill your special meter or character icons for other special abilities. Good old gameplay: A very simple story plot explains why you must hit the colourful looking Doughlings. While the game has some fresh ideas the good old brick destroying gameplay has a big focus. Make sure that your ball (medicine) keeps hitting faces and don’t let it fall below your screen. Easy to pick up, understand and lovely to play. Old pony, new tricks: Doughlings plays like the years-old other brick breaker games but it has a list of new features that help make the game feel fresh and even more fun! Character specific abilities for example really spice up the gameplay and allows for some tactical play. Knowing when to unleash your “show off” move (the aforementioned abilities) can be important for bigger high scores. Skill trees: A robust skill tree system gives a lot of depth, something you wouldn’t expect for this genre. I was very pleasantly surprised that some skills really change your tactics and prefered way of playing it. Upgrading your show off moves makes the game easier so keep that in mind for beating high scores from friends, it might be worth it to level up your characters first before tackling the high scores! Addictive: Trust me when I say that Doughlings: Arcade is hard to put down. That ” one more level” feeling is something that persists, even after playing it for hours. Endless replay value: Included with the game is a level editor that gives players ridicules replay value. Playing levels from friends or random strangers and sharing your own levels is really easy and fun to do. As always, the creativity that some gamers have is really incredible and user created stuff always manages to impress me. Sure you have a few stupid created levels but the awesome levels make up for that. Performance: It caught my attention that the frame rate isn’t always stable, it doesn’t give any sorts of gameplay issues but the slowdown was noticeable. That said, it doesn’t ruin the fun. Visuals: While cute and charming the visuals aren’t really spectacular or great. It will get the job done but I missed a little more unique backgrounds. I understand that it is a hard to impress players visually with this kind of game though and it definitely doesn’t hurt the gameplay. 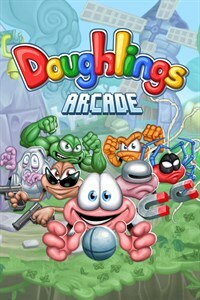 Doughlings: Arcade [Score: 83%] Ignoring the sound, Doughlings Arcade is a perfect game to play on your Xbox One, the accessible addictive gameplay for all ages will be loved by many gamers.